A US Navy Ocean Tug ship and a helicopter of the Bahrain-based Fifth Fleet particpate in a crisis response exercise in a port in the capital Manama, 06 November 2007. 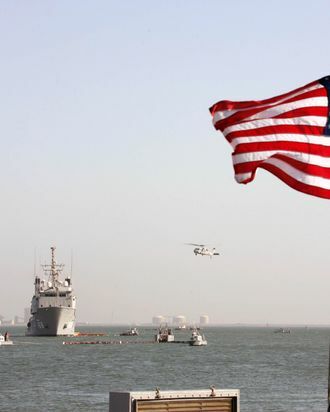 US naval forces in the Gulf said it had carried out today a crisis response exercise involving a mock oil spill at a Bahraini port. The FBI and Nassau County police raised the “Kandi Won” 60 feet from the bottom of Oyster Bay on Wednesday afternoon, where the 34-foot yacht capsized on the Fourth of July, killing three children who were among the the 27 passengers aboard, NBC New York reports. The children were trapped inside the yacht’s cabin. According to the Associated Press, authorities are attempting to determine if the yacht capsized as a result of overcrowding, a mechanical malfunction, or rough weather conditions, as the operator’s attorney contends.